The cover and table of contents for Issue #32 are shown below. 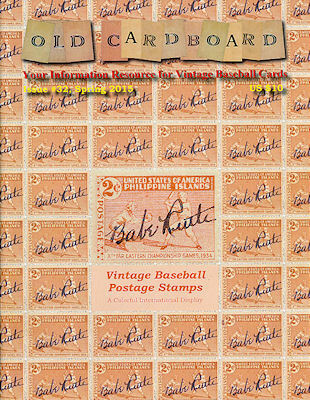 1) "Baseball Postage Stamps: A Colorful International Display" by Lyman Hardeman. 2) "Babe Ruth and the 1917 Red Sox Ride in Style to Spring Training" by Old Cardboard Staff. 3) "1909-1910 Clement Brothers Bread: Still Keeping Its Secrets After 100 Years" by Paul Kaufman. 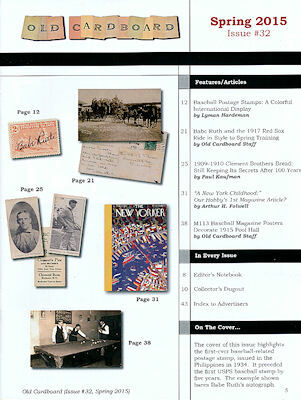 4) "'A New York Childhood:' Our Hobby’s 1st Magazine Article?" by Arthur H. Folwell. 5) "M113 Baseball Magazine Posters Decorate 1915 Pool Hall" by Old Cardboard Staff.